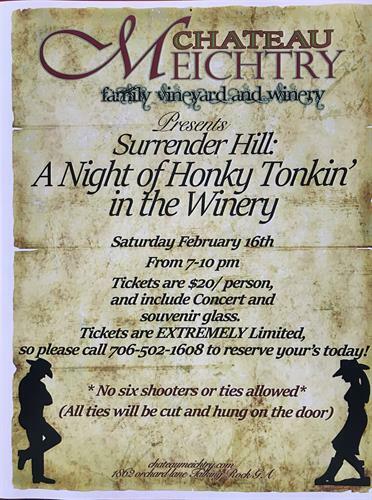 Chateau Meichtry presents Surrender Hill: A Night of Honky Tonkin' in the Winery. Join us for a very special concert! Wear your boot & hats!! **NO TIES ALLOWED!! ALL TIES WILL BE CUT OFF & NAILED TO THE WALL. ** This is going to be a very limited seating event, with only 60 guests, so please call us to to reserve your tickets sooner than later at 706 - 502 -1608.